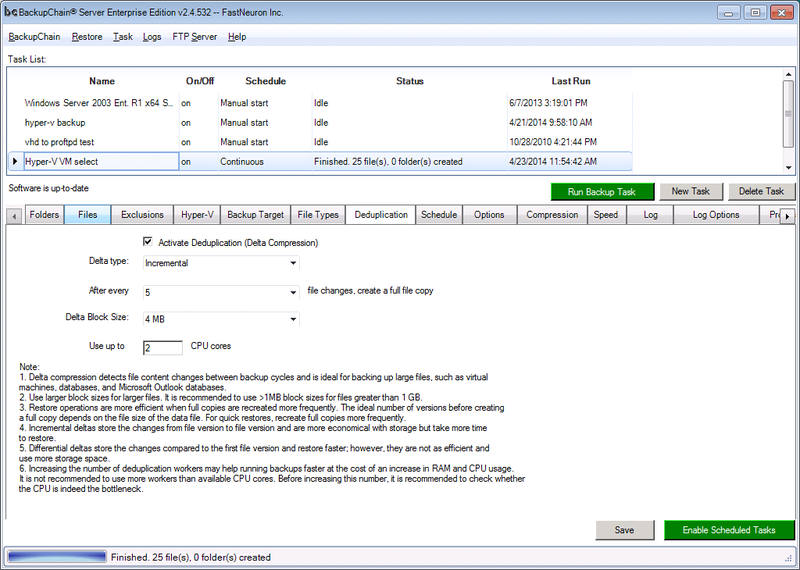 Deduplication of backup storage is especially important in the case of virtual machine backups. Whether you're using Hyper-V Server VMs or VMware, optimized storage usage is of paramount importance, since VHD and VMDK files tend to be huge. It's therefore ineffective to store them in full after each backup. Using BackupChain (see screenshot below) you can specify incremental and differential deduplication for your Hyper-V and VMware backups. Those so-called in-file delta compressed backups are created automatically and each backup cycle refers to the previous one. The storage savings are substantial: after the full backup, each daily backup is reduced to around 5%. Example: Say you have a 100GB virtual machine. The first backup will be a compressed full backup at perhaps around 40GB. The next daily increments, using deduplication, are typically compressed down to 2-5 GB per day. However, virtual machine backup deduplication requires a couple more tweaks for optimal performance. For example, if backups are taken at night and the VMs aren't being used much, you could increase the number of CPU cores used for backups and have the backup task finish faster. Alternatively, if backups are taken during the day, the deduplication task may be configured to use just one or two CPU cores so it leaves enough resources left over for VM processes. Another common variable that advanced users may want to change is the block size. Since deduplication works on blocks, the block size has a direct effect on performance and storage usage. Larger blocks reduce overhead and increase speed; however, they are inefficient with space usage. Smaller blocks are more efficient with storage space but require more CPU work.